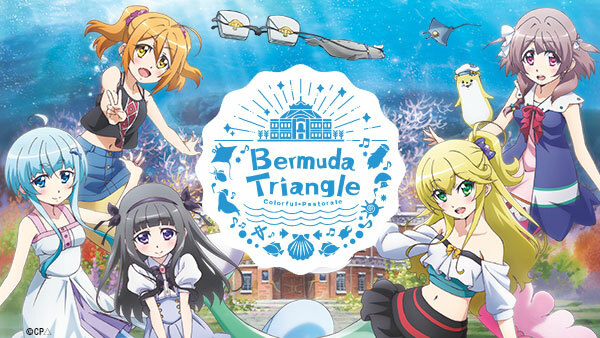 Sign up now to stream Bermuda Triangle ~ Colorful Pastorale, subs, tons of dubs, OVA's, simulcasts, plus the all new Dubcast℠ editions and more! There’s a new mermaid in town, and she’s not impressed by the work the girls have done on the theater. Can the screening of a special film change her tune? Life in Parrel isn't always eating cake and making friends, there is much to learn and explore, but what happens when the girls discover a hidden treasure? Despite Ardi’s warning not to return to the theater, Sonata cannot just forget what they found there. When she later turns up missing, Caro has a good idea where she went. The girls start renovations to the theater, but it’s missing a certain something. What can they do to make it a little more cozy? Serena doesn’t understand; The projector should be working, but it’s not. Something’s being overlooked. What could it be? Success – the movie theater is now up and operational, but this is only the beginning. Now its time to host a screening! Fina finds an unusual Cineorb inside the movie theater. Will the strange tide rolling over Parrel unlock its secrets? The girls run an errand — on land! Will they enjoy being part of our world, or do they really belong under the sea? E9 | Hey, Do You Want Some, Too? Caro lands a role in a movie being filmed in Parrel! Hopefully she can overcome her nerves in time to film her scenes. E10 | How Do You Film With This, Anyway? When Canon is offered an audition in Atlantia, she finds herself torn between staying in Parrel and returning home—and a severe case of crystallization isn’t helping matters! The mermaids of Parrel always get their mail… eventually. Could a belated delivery of Canon’s letters to Verata shed some light on her true feelings?